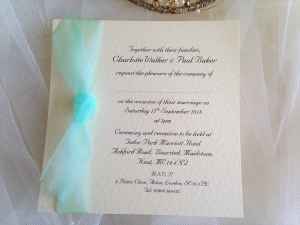 This is just a small selection of Mint wedding invitations to give you some ideas – the majority of our wedding invitations on the main page are available with ribbon to match your colour scheme. Fresh and beautiful mint is becoming the wedding colour scheme of choice for chic and sophisticated brides. A Spring wedding colour palette which is a modern mix of mint, soft blue, grey and daffodil yellow… Perfect if you’re planning an April or Easter wedding. Refreshing, exquisite and very relaxing, we stock mint ribbon in satin and organza ribbon. Order your wedding invitations today.